How much do Army vs Navy suites cost? Army vs. Navy suite prices are going to range from $25,000 - $45,000 on average. The Army vs. Navy football game at Lincoln Financial Field always sells out early. Lincoln Financial Field suites will mostly accommodate 20-24 guests for the Army vs. Navy game. VIP parking at the Linc will be included with a luxury box. 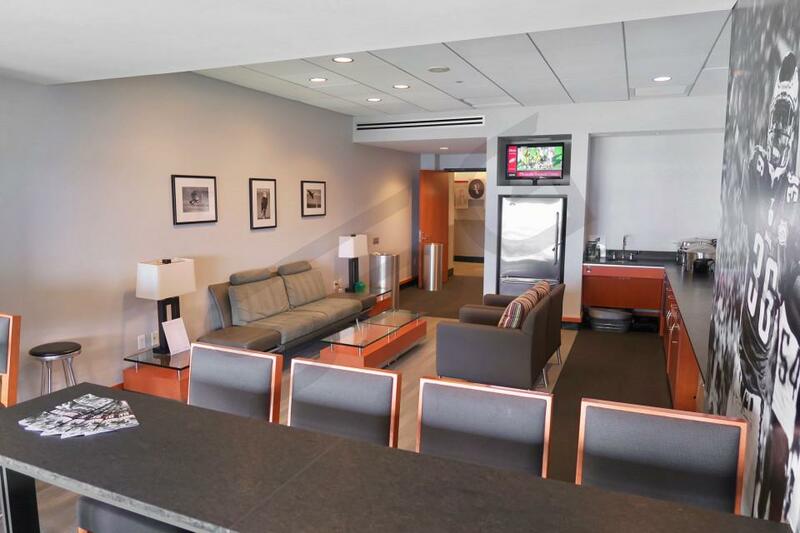 A Lincoln Financial Field Club Level suite includes a wet bar, attendant service, HDTVs, a climate-controlled environment, private restroom, premium seating and in-suite catering options. You will exclusive access to Club Level lounges and private entry into Lincoln Financial Field. Lincoln Financial Club Level suites are going to be between the Club Level seating and upper level seating sections. The President's Club consists of 14 private luxury suites sitting on top of the lower level suites on the west side of the stadium (Eagles home side). President's Club is 3,500+ square feet of shared space including buffet area, upscale restrooms, multiple high-definition televisions, fireplace and much more. Many would say that this is the most prestigious location at Lincoln Financial Field to view an event. There is a complimentary high-end buffet served 1 hour prior to kick off thru half time at all Eagles games. Beverages, including beer, wine and liquor are included. This Lower Level suite includes 20 tickets and 4 VIP parking passes. You can purchase up to 4 additional tickets. You will exclusive access to VIP lounges and private entry into Lincoln Financial Field. Inside an Eagles Lower Level suite will be HDTVs, upscale furnishing, premium seating and a wet bar. 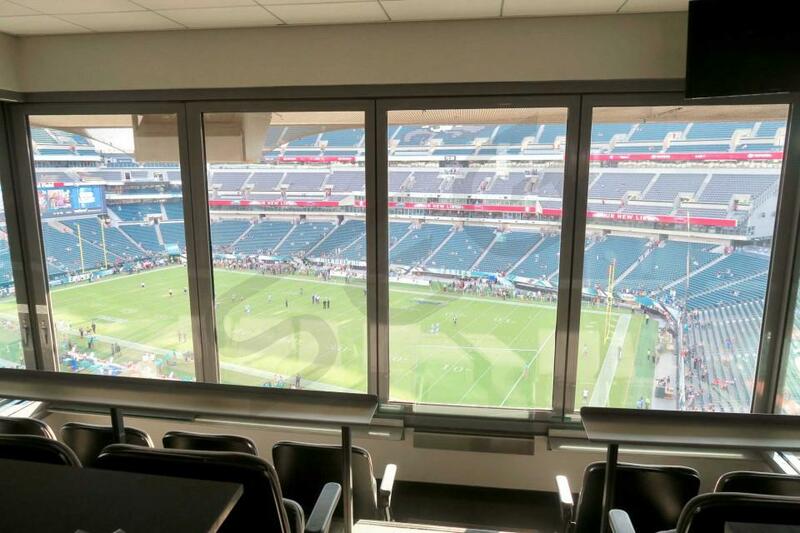 Suite Experience Group helps customers through North America and the world plan corporate and personal events in private Luxury Suites at Lincoln Financial Field. 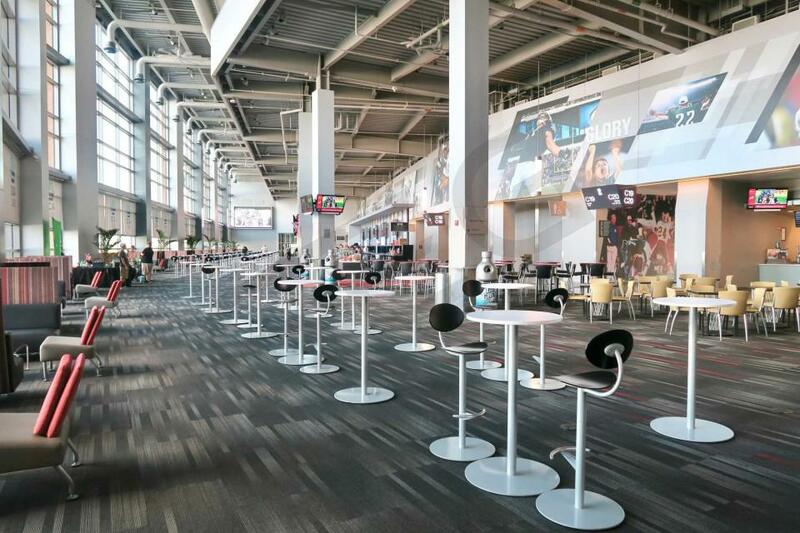 In this section we’ve put together the key considerations when planning an event at The Linc. 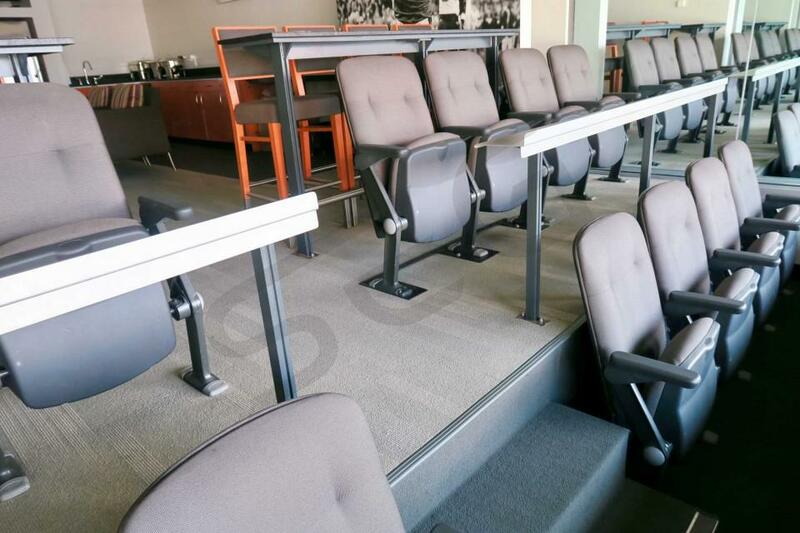 With four different styles of suites, Lincoln Financial Field can accommodate a range of group sizes and needs. The smallest and most exclusive suites are the President's Club Suites, located between the 20 yard lines on the Eagles side of the field. President's Club suites come with 14 tickets and 4 VIP parking passes, with an option to purchase up to 4 "standing room" passes. 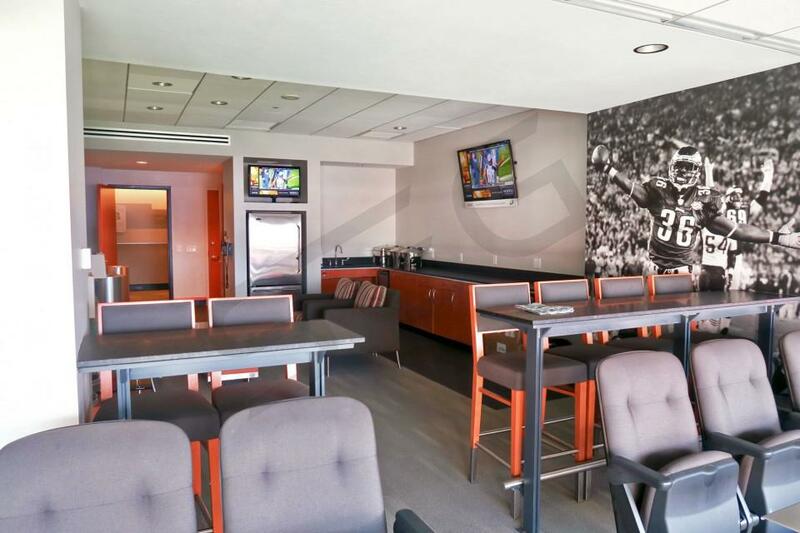 In addition, President's Club suites include food and beverage in the stadium club directly behind your suite. The closest suites to the field are the Lower Level Suites, which come standard with 20 tickets and have a max capacity of 24 guests. The Club Level Suites are the upper tier of suites, while the Red Zone suites have an end-zone view above the 100 level section of seating; both of these suite types come with 20 tickets. Regardless of which suite level you choose, the amenities inside the suite make for a first-class experience for guests of all ages. 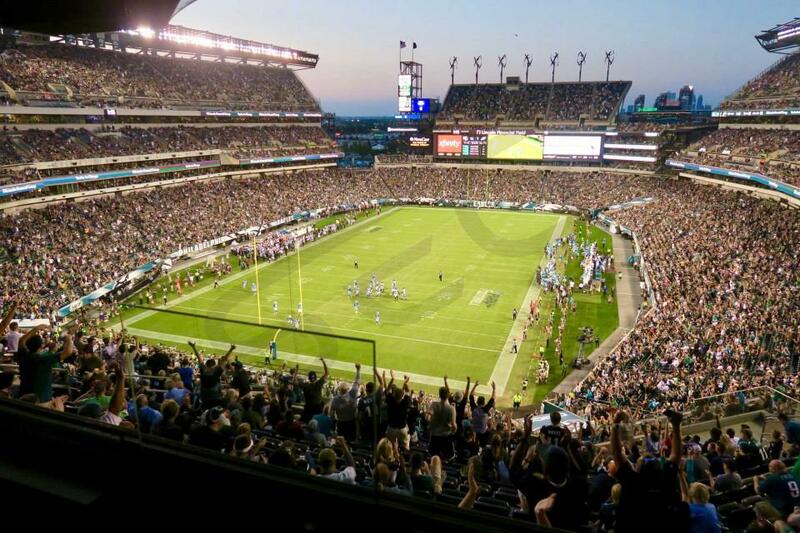 Private luxury suites at Lincoln Financial Field generally range from $10,000 - $30,000. After the Eagles won the Super Bowl in 2018, demand jumped significantly and some Eagles games are sold out. Luxury boxes at Lincoln Financial Field are great for Temple games, concerts, and the NCAA College Lacrosse final four. A particularly popular event is the Army Navy game that often comes to Philadelphia, where prices can exceed $30,000. 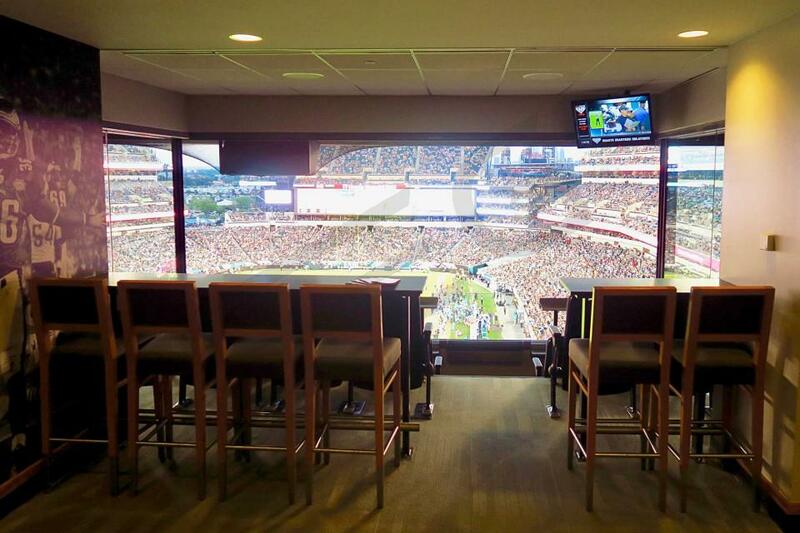 All luxury suites at Lincoln Financial Field offer an extensive suite catering by Aramark. Typically, orders for your suite during Eagles games must be placed at least 5 business days before the event. You will have an attendant in your suite to assist during the game and orders can also be placed the day of the game in the suite from a limited game day menu. Aramark puts together a custom Suite Catering Menu every year for the Linc and it never disappoints. The Linc has predetermined packages as well as a build your own menu option. They proudly serve Dunkin’ Donuts, Bud Light, Miller Light, Amorso’s rolls, and many others. Other highlights on the suite catering menu include Philly cheese steak spring rolls, shrimp cocktail, and pan seared crab cakes. The menu includes countless tasty dessert options and even caters to anyone sensitive to gluten. Lastly there is a plethora of beverage packages offered. Luxury suite tickets at Lincoln Financial field will give you access to two exclusive climate controlled Club Lounges. These two 40,000 square foot stadium clubs are located on club level of both sidelines and offer full bars, private concession stands, comfortable seating and many flat screen TV’s. Often times cheerleaders and alumni will host autograph signing sessions in the lounges. Many Eagles fans will be wearing their favorite player’s jersey, however, many other guests in the suites will be dressed in business casual attire. All suites have windows that can be opened or closed so we recommend checking the weather before the game in case your party decides to keep the windows open. There is a closet in each suite for storage of heavy coats during the game. 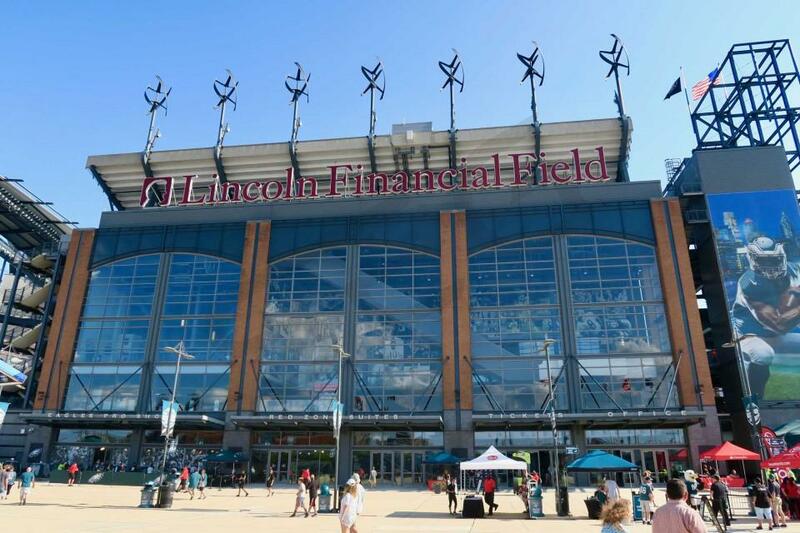 Lincoln Financial Field is located at 1 Lincoln Financial Field Way in Philadelphia. There are some public transportation options but driving to The Linc may be the best mode of transportation, assuming you have a VIP parking pass. Ubering to the stadium is also effective. Guests should plan to get to the stadium complex at least an hour before the game. The quickest way via public transportation would be the SEPTA Broad Street Subway Line to AT&T Station. If it is a night game, SEPTA Broad Street Line will run until shortly after the games end. Most private luxury boxes at Lincoln Financial Field come with 4 VIP parking passes. If you do not have a parking pass it will cost $40 for a normal sized vehicle and $80 for oversized vehicles. Additionally, there is a private entrance and dedicated VIP ticket will-call. Each ticket and parking pass will include the names of the entrances and the parking lots you should use. VIP Will Call windows are located near the suite entrances. There are two suite entrance locations, one on the east side of the stadium (SCA Club) and one on the west side of the stadium (Panasonic Club). All Suite Tickets will include entrance into the suite area for at least two hours before the game and up to one hour after the game. 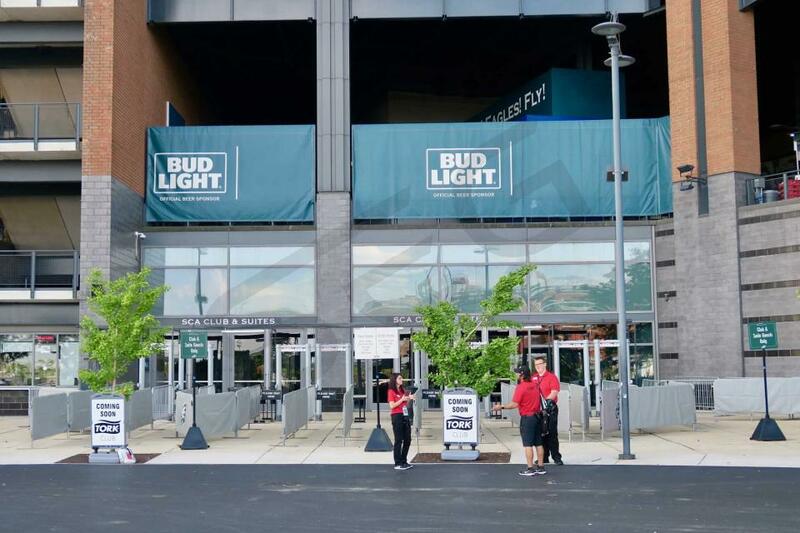 All fans entering The Linc will go through a metal detector screening, The NFL has implemented a policy that patrons must bring all their items in bags that are clear plastic, vinyl or PVC that does not exceed 12" x 6" x 12." The Army vs. Navy football game takes place this year on December 14th at Lincoln Financial Field. The Black Knights and Navy Midshipen battle it out for the for bragging rights and the “Thompson Cup.” The Army vs. Navy football rivalry dates back to 1890, when the two schools faced off for the first time at West Point. There are 3 suite levels at the Linc in Philadelphia where fans can experience first-class amenities and enjoy the game in a climate-controlled environment. Having a heated suite, food and beverages at arms’ reach and premium seating makes a suite for the Army vs. Navy game a must. The lower level and club level will feature suites that can accommodate groups of 20 – 24 guests. The President’s Club level will be a bit smaller and accommodate groups of 14 – 18 guests. In most cases with a luxury box for Lincoln Financial Field, you’ll be given 4 VIP parking passes as well. On Saturday, December 9, 2017, Army vs. Navy will battle it out at Lincoln Financial Field in Philadelphia. The winner of the Army vs. Navy game is awarded the “Thompson Cup”, named after its donor Robert M. Thompson. The first game ever played between Army vs. Navy was in 1890 at West Point and then in Annapolis the following year. Philadelphia has hosted the Army vs. Navy game more times than any other city. A luxury suite for the Army vs. Navy game provides the ultimate fan experience. 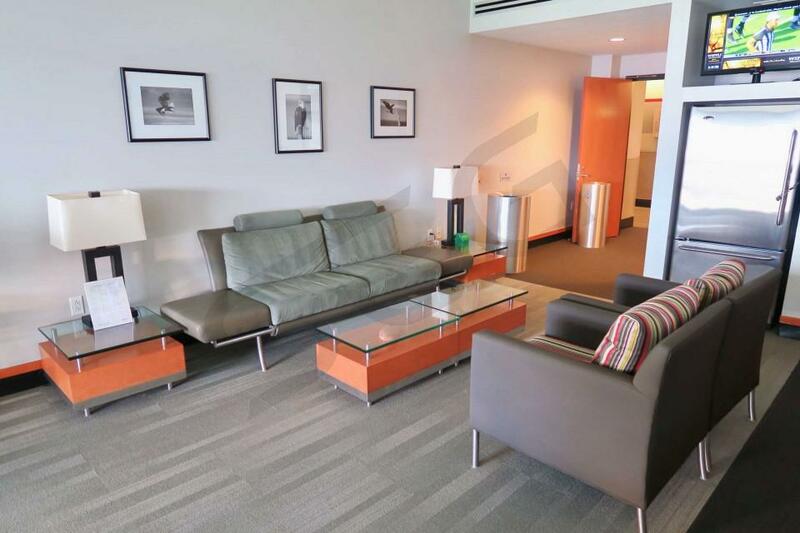 A Lincoln Financial Field suite offers unparalleled access and amenities for any client, employee, or family outing. Army vs. Navy suites include 20-24 tickets and 4 VIP parking passes. An Army vs. Navy suite will also feature a climate-controlled environment with retractable windows, suite attendant services, premium seating inside and outside of the suite, HDTVs, in-suite catering options and a wet bar. Along with your Lincoln Financial Field suite for the Army vs. Navy game, guests will receive private entry into the stadium and exclusive access to Lincoln Financial Field’s VIP clubs. Thank you for signing up for specials at Lincoln Financial Field. Enter your email address below to stay in touch. We'll sign you up for our newsletter, which will inform you of the latest inventory and events at Lincoln Financial Field. We promise we will never sell or distribute your information. 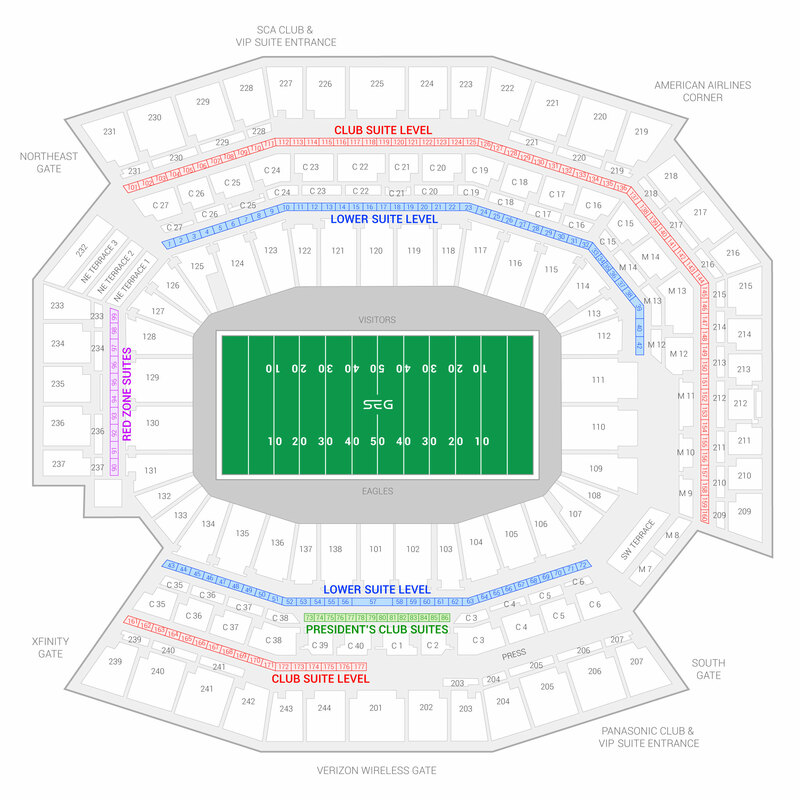 The seating chart below shows where the Army Black Knights vs Navy Midshipmen suites at Lincoln Financial Field are located.